Reference number for this case: Oct-54-Yvetot. Thank you for including this reference number in any correspondence with me regarding this case. There were "two loud bangs", "a luminous globe", it was around 4 p.m. and the witness was a "trustworthy" lady who "went about her business." She had "suddenly" noticed "a curious craft in the shape of a luminous globe, which was moving at a vertiginous speed, having the sound of an ordinary plane, leaving behind a strong trail of smoke, crossing the firmament of West to Northwest" and "disappeared after a few minutes all of a sudden." The newspaper suspected that it was probably a meteor. Two strong detonations... a luminous sphere... A certain day of last week, around 4 p.m., a lady - worthy of faith - was busy with her work, when she suddenly saw a weird machine having the shape of a luminous sphere, which moved at a vertiginous speed, with the noise of an ordinary plane, leaving behind a strong trail of smoke, crossing the heavens from the West to the North-West. The machine disappeared after a few minutes all of a sudden. An aerolite probably... but at these flying saucers times, you never know. Possibly meteor or probable jet plane. 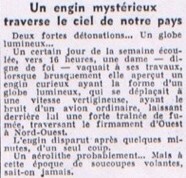 [---] Article in an unknown newspaper in October 1954. 1.0 Patrick Gross October 21, 2011 First published. 1.1 Patrick Gross April 5, 2019 Addition of the Summary. In the Explanations, addition of the paragraph "(In France, the first jet plane sonic boom..."
This page was last updated on April 5, 2019.